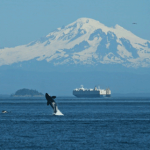 The Enhancing Cetacean Habitat and Observation (ECHO) Program is a Vancouver Fraser Port Authority-led initiative aimed at better understanding and managing the impact of shipping activities on at-risk whales throughout the southern coast of British Columbia. The long-term goal of the ECHO Program is to develop mitigation measures that will lead to a quantifiable reduction in potential threats to whales as a result of shipping activities. British Columbia has a productive coastal ecosystem that sustains populations of whales, porpoises and dolphins (cetaceans). published Species at Risk Act Recovery Strategies and Action Plans for a number of at-risk whale species in the region designating critical habitat. 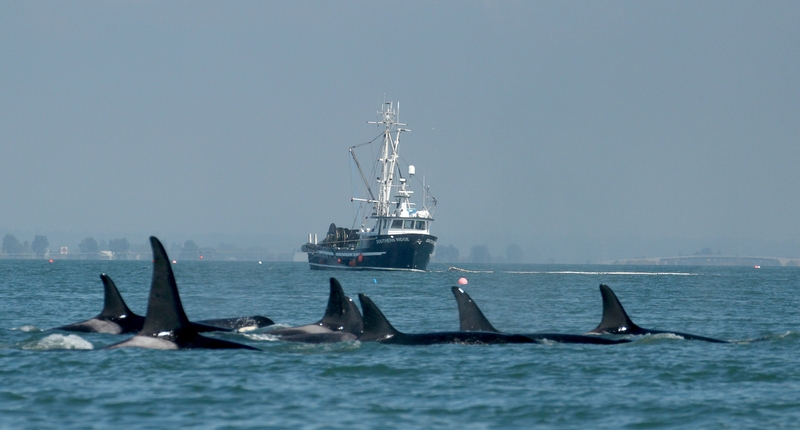 Much of the commercial vessel activity in the southern coast of British Columbia transits designated critical habitat of endangered southern resident killer whales as well as areas known to be of importance to other at-risk whales. We are committed to conducting operations in a responsible and sustainable manner that safeguards and promotes continual protection of the environment. For these reasons, the ECHO Program has been developed. 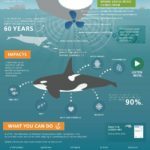 Learn more about whales in our waters. Developed for mariners by BC Ferries and the Vancouver Fraser Port Authority-led ECHO Program in partnership with Ocean Wise, the Whales in our Waters tutorial covers a range of topics including the need to protect local whale species, tips for identifying and reporting them, and best practices to implement when navigating ships in their presence. 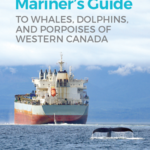 Regional mariners, particularly those operating large vessels such as ferries, cargo ships or tugs, are encouraged to complete the Whales in our Waters tutorial in advance of the summer season, when many whale species return to the Salish Sea to feed. The ECHO Program has benefited from early input and advice from scientists, shipping industries, conservation and environmental groups, First Nations individuals and government agencies to help the program focus efforts and set goals and objectives. acoustic disturbance – Whales use sound to find their food, mate, communicate, and avoid danger. Vessel activity increases underwater noise and can impact these function. Read about ECHO underwater noise reduction projects here. 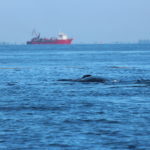 physical disturbance – Vessel traffic has the potential to impact whales through ship collections or by altering their normal behaviour and movement. 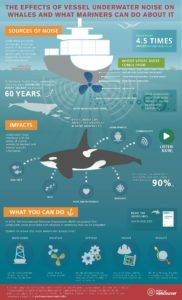 environmental contaminants – Contaminants can accumulate in a whale body, potentially impacting reproduction, development, and immune system functions. 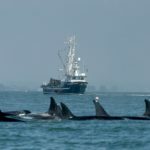 The availability of prey, in particular Chinook salmon, for southern resident killer whales is critical to the species survival. Although the ECHO Program focus is on the effects of shipping and port activities, the importance of fish habitat supporting prey availability for whales is acknowledged. Our habitat enhancement program is focused on creating and enhancing fish and wildlife habitat, which may help address this threat to at-risk whales. The aim of all ECHO projects is to inform potential mitigation options and develop innovative solutions to reduce underwater noise in the region. Potential mitigation measures may include such things as incentives or recognition for the use of green vessel technology, changes to operational activities of ocean going vessels, recognition of certification programs for quiet vessels, and/or the development of noise criteria for vessels entering the port. The Vancouver Fraser Port Authority’s incentive program, EcoAction, or the Green Marine program may be avenues for implementing proposed mitigation options. In 2015, the ECHO Program advisory working group helped identify underwater noise as a priority focus area based on impacts to species-at-risk, in particular the southern resident killer whales. The ECHO Program supports a series of individual short-term projects, scientific studies and education initiatives. These projects will provide a better understanding of vessel-related cumulative regional threats, informing the development of mitigation solutions. To this end, the ECHO Program has convened several technical committees, made up of technical experts including marine mammal researchers, naval architects and acoustic specialists, to help develop a work plan for the ECHO Program to address underwater noise. Whales use sound to navigate, communicate, and locate prey. The Fisheries and Oceans Canada recovery strategy suggests that increased vessel traffic is responsible for the increase in ambient noise levels detected over the last 100 years. For this reason, underwater noise is a priority study area the ECHO Program is addressing. 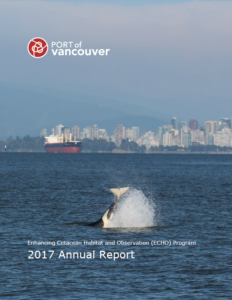 In 2018, The Enhancing Cetacean Habitat and Observation (ECHO) Program undertook two key initiatives which focused on reducing underwater noise from large commercial vessels within designated critical habitat for the endangered southern resident killer whale population. Between August 7 and October 6, 2017, commercial vessels were asked to slowdown to 11 knots through Haro Strait, an important summer feeding area for southern resident killer whale, to better understand and measure the level of noise reduction achieved through reduced vessel speed. 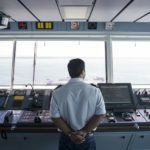 What makes vessels quieter? This study scanned the best options to reduce underwater noise from vessels. The study recommended options to be included in the port authority’s EcoAction program which incentivizes vessels for going above and beyond environmental regulations. As of January 1, 2017, vessels with quiet classification notations or cavitation reduction technologies calling the Port of Vancouver are eligible for a discount on harbour due fees. How do different vessels sound and where and how often do they transit in this region? 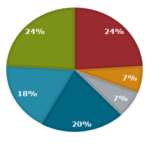 This study identified and quantified the underwater noise contributions from various vessel sectors to overall regional ocean noise. 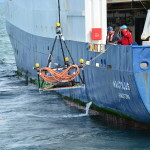 In partnership with Transport Canada, Fisheries and Oceans Canada, Ocean Networks Canada and JASCO Applied Sciences, Vancouver Fraser Port Authority installed an underwater listening station in the Strait of Georgia in September 2015. The station was maintained and operated for over two and a half years, monitoring not only vessel source levels, but also marine mammal presence and total ambient underwater noise. The Strait of Georgia underwater listening station project is complete and the final report is available below. 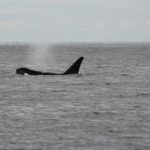 Led by SMRU Consulting, this study sought to better understand how southern resident killer whales respond to underwater noise from both large commercial vessels and smaller whale watching boats. The ECHO Program and Fisheries and Oceans Canada supported a small vessel underwater noise measurement study in Haro Strait to better understand the underwater noise levels of whale watching boats and other small vessels that operate in the Salish Sea near southern resident killer whale summer feeding habitat. This study was conducted in parallel with another study measuring underwater noise levels from large piloted commercial ships in Haro Strait. The ECHO Program has also completed or is working on additional acoustic projects which include. Monitoring baseline regional ambient underwater noise conditions through a network of hydrophones. PROJECT ONGOING. Presenting the impacts of underwater noise on marine mammals to local mariners through an education outreach program. PROJECT ONGOING. 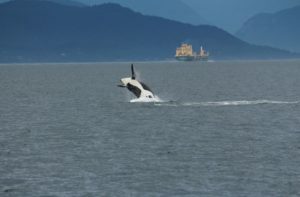 Investigation of the potential effects of ship noise on humpback whale calls in B.C. waters. This infographic was designed to help mariners understand the impacts of vessel underwater noise and how to reduce it. Print out a copy and post it on your vessel’s bridge or common area. Where is the risk of whale vessel strike the greatest? The ECHO Program supported Fisheries and Oceans Canada’s survey of large whale distribution off south western Vancouver Island using aerial surveillance and satellite tagging, to help identify key areas where the risk of physical disturbance or collision is greatest. In collaboration with the Ocean Wise and Prince Rupert Port Authority, the ECHO Program supported the development of the Mariner’s Guide to Whales, Dolphins, Porpoises of Western Canada which helps mariner’s identify marine mammals, their seasonal usage of areas along the west coast and identifies ways to reduce potential interactions. The WhaleReport Alert System app will help to notify select regional commercial vessel operators when whales are in their proximity. This project is in development and is led by the Ocean Wise’s BC Cetacean Sightings Network, in collaboration with the ECHO Program and the Prince Rupert Port Authority. The ECHO Program is supporting PollutionTracker, an Ocean Wise initiative, to collect and analyze samples of sediment and mussels to establish baseline levels of environmental contamination and inform best practices in and around the water.